← Guest Authors: Charlie and Diego–The One and Only Ivan! 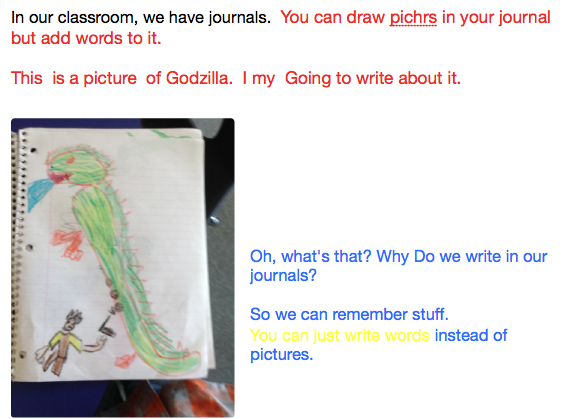 Posted on March 9, 2015 by Jen Bearden	• This entry was posted in Classroom, First Grade, Technology, Writing and tagged audience, blog, first grade, journals, Notability, purpose, technology, writing. Bookmark the permalink. I think it is super cool to draw pictures AND write in your journal. I just got a new journal. It is pink so I will not lose it. What kind of things do you write in your journals? So fun! I have always wanted to keep a journal — I think you’ve inspired me to just do it! How do you think of things to write and draw about? That is a very nice picture! At what point of your day do you write in your journal? Is there a certain topic you are supposed to write about each day?